It's an age-old debate: is the hot dog — a meat tube resting in a partially-sealed bread pocket — a sandwich? Would-be sandwich arbiter Merriam-Webster thinks so. And the Internet is not pleased. It all started with this haughty tweet, which purported to celebrate all the sandwiches we'll eat over Memorial Day weekend. But Twitter saw Merriam-Webster's hidden agenda: to settle a debate that just isn't ready to be settled. Others brought other carb + meat combinations into the mix. What about a taco? A gyro? A quesadilla? Must the meat lie horizontally? Must there be two separate slices of bread? Does the filling matter, or just the bread configuration? 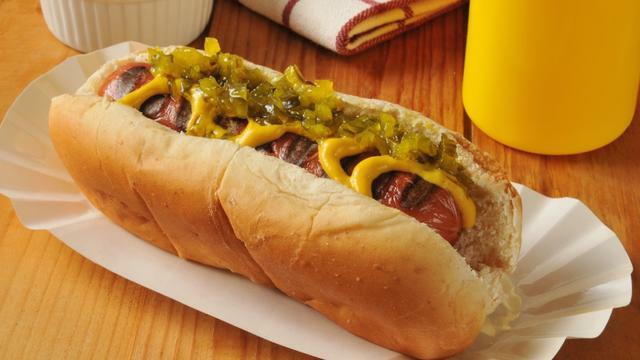 Will we ever know if a hot dog is really a sandwich? Maybe not — and maybe that's okay. Maybe we should back away from each other very slowly, drive to the beach or a local park and enjoy our Memorial Day weekends. Hot dogs with ketchup, mustard, lettuce, and pickles. Classic hot dogs with ketchup and mustard. A pair of hot dogs, fresh off of the campfire and topped with cheese, onions, chili and cilantro. The frankfurters in Sonic's new lineup all start with a grilled, all-beef hot dog inside a "soft, warm bakery bun," and are each differentiated by their fixings: the All-American Dog has ketchup, mustard, relish, and chopped raw onions (386 calories); the Chili Cheese Coney is topped with chili and shredded cheddar cheese (420 calories); the New York Dog has spicy mustard, grilled onions, and sauerkraut (352 calories); and the Chicago Dog is topped with a pickle spear, relish, tomatoes, hot peppers, chopped raw onions, celery salt, and mustard, with poppy seeds on the bun (435 calories). Kurobata Pork Dog and hot dog on white dish. Ketchup, mustard, onion and relish on a hot dog with US Flag. Grilled hot dog with raw red onions and spicy mustard. Three types of gourmet hot dogs. Zucchini, Pepper and onion with Chicken Dog, Sauerkraut, Beef Dog on Pretzel Baguette, Beef and Pork with shrimp, Avocado and Nori. Hot dog with relish, raw onions, chopped tomato, and fries.